PENCILLER: Esad Ribic. Cover by Alex Ross. We spend most of this issue exploring Battleworld, a planet made up of pieces of the traditional Marvel Universe, the Ultimate Marvel Universe, and various other universes and timelines. To Jonathan Hickman’s credit, there’s a hierarchy to the world that seems very thought-out. The emerging conflict in this story seems very organic. This runs contrary to what DC did with Convergence, which segregated all the alternate universes, and then had a God-like figure simply force the various characters to fight. – Doctor Doom is revered as a god and an all-powerful creator. – Doctor Strange is Doom’s right hand and acting lawmaker. – This world’s police are the Thors, who police the various realms. They essentially guide us through the issue, and the world at large. – Those who breach the borders must become part of The Shield (No wrestling fans, not that Shield. ), a group that guards the realms from various hazards and hostilities. – More serious offenders may be banished to the Deadlands, i.e. an underworld which is home to symbiotes, Ultron robots, and Annihilus drones. If you’re watching Game of Thrones, much of this should seem familiar, particularly the stuff about The Shield and the Deadlands. I half expected to see Jon Snow pop up during the second half of the issue. Still, it works. And it’s all so rich in Marvel mythology, most of which newer Marvel readers (and perhaps even some of the more seasoned ones) won’t pick up on. 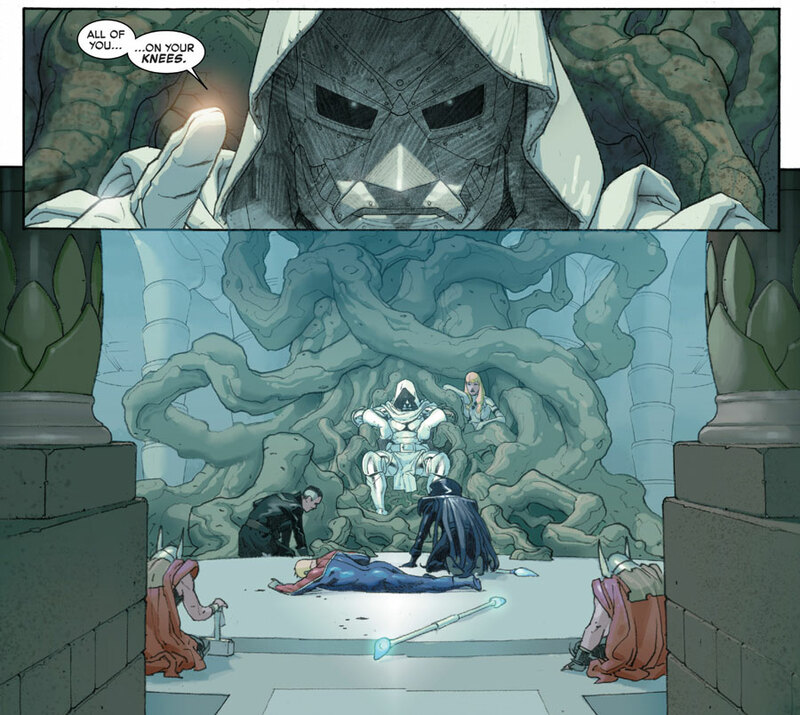 As compelling as Battleworld itself is, the most interesting aspect of this issue is Doctor Doom himself. We see that in addition to Doctor Strange, Sue Storm and her daughter Valeria are among his inner circle. The fact that they’re there, especially considering this is the original Marvel Universe’s Doctor Doom (As said by Hickman himself. ), is extremely interesting. The duality between Doom’s more natural sadistic state, and the more merciful side we see brought to the surface by Sue, is also curious. How this progresses, and presumably unravels, in the issues to come will be interesting to see. There’s also an interesting Science vs. Religion conflict here. Apparently the Thors have another job: To quarantine and keep secret anything that might cause believers to lose their faith in Doom as a god. Yet another curious seed planted. 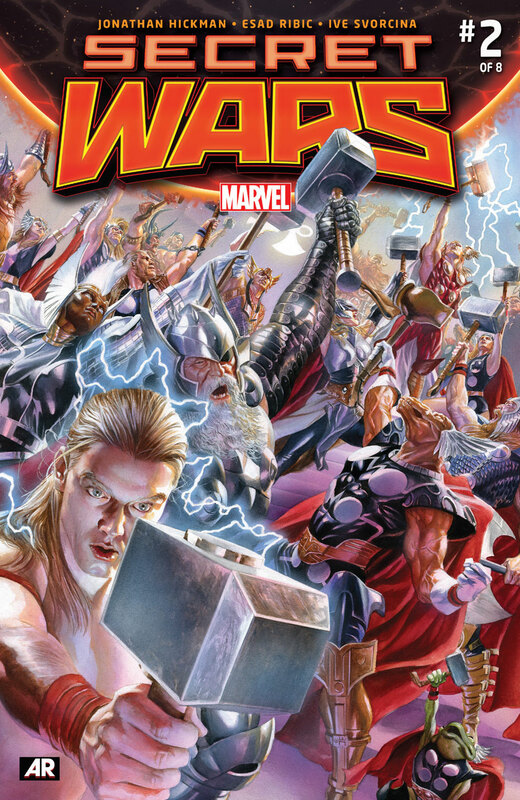 Needless to say, there’s a lot to sink your teeth into with Secret Wars #2. But if you’re willing to stick it out and wade your way through the initial confusion, you’ll find out there’s a pretty good story on the table here. Granted, there’s still plenty of time for them to screw it up. But for now, they’ve got me interested. And as someone who’s been out of touch with Marvel lately, that’s no small feat. Image 1 from comicvine.com. Image 2 from author’s collection. This entry was posted in Comic Books/Graphic Novels and tagged Alex Ross, Battleworld (Marvel), comic book reviews, comic books, Doctor Doom, Doctor Strange, Esad Ribic, event comics, Game of Thrones, info-dump, Invisible Woman, Jon Snow, Jonathan Hickman, Marvel, Mr. Sinister, Rob Siebert, Secret Wars #2 (2015), Secret Wars #2 review, Secret Wars (2015), single issue reviews, Sue Storm, Thor, Valeria Richards on 05/13/2015 by primaryignition.